This story has several origins, two of which are worth mentioning. The first one jumps out while looking at a map of Rocky Mountain National Park, where the lower third of the Park east of the Continental Divide consists of Wild Basin, the watershed of the North St. Vrain River. This 70-square-mile arena is ringed by high peaks on three sides, circling from Mt. 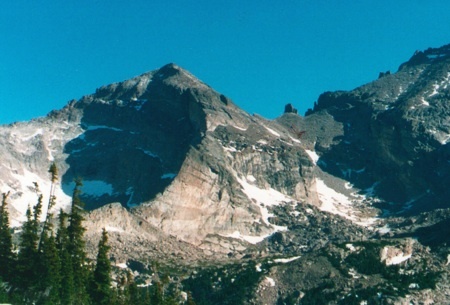 Meeker and Longs Peak in the north to Ogalalla Peak and Elk Tooth in the south, all connected by a high continuous ridge. It would be impossible to design a more imposing and tantalizing closed-loop ridge run than the circumnavigation of Wild Basin. Buzz Burrell and I fell to the temptation in 2002. I remember that June day well. We set out early running the Sandbeach Lake trail; but before we even began the 3500-foot ascent of Mt. Meeker, we were feeling the effects of forest fires raging to the west. The air was thick with smoke and as we climbed, even the nearest peaks were shrouded in smoke. We persevered for 12 hours, with the efficiency of emphysema patients, managing to top out on Mt. Meeker, Longs Peak, Pagoda Peak, Chiefs Head, and Mt. Alice – far short of the full circuit. Although we could blame it on the smoke, we also suddenly appreciated the enormity of the project and questioned our ability to succeed even in good conditions. The second thread that leads to this tale is an age-old personal project called Self-Powered Ascent of Mountains in Boulder County (SPAM-BC). The rather contrived goal is to climb all the named summits of Boulder County starting from within the Boulder city limits using only bike and/or foot power. (This idea may have been inspired by Gerry Roach who has set foot on all of the named county summits.) I have whittled away at the list for many years, focusing mainly on the high peaks in the western county. As of last year, I had done all of the peaks on the Continental Divide except for some troublesome outliers, not surprisingly, on the Wild Basin Rim. August 11, 2007, 4:30 AM – Leaving Boulder on my bicycle, I uncharacteristically did not have a clear plan. Thoughts of the Wild Basin Rim and the self-powered ascents were hopelessly conflated in my mind. I had a slow ride against headwinds to the Wild Basin Ranger Station, where I changed into running shoes and went looking for water to fill my empty bottles and Camelback. A ranger informed me that potable water was not available at the trailhead, but I could buy bottled water at the nearby store. Needless to say, the price of water was twice that of gasoline. I bought all the water I could afford – two 16-ounce bottles to last me all day. At least I would be traveling light! I began a trailless, timber-thrashing, fall-line ascent along Hunter’s Creek toward Sandbeach Lake, still without a clear plan. Within an hour, I had to decide whether to head for Mt Meeker and the start of the Wild Basin Rim. Time and energy were being consumed faster than expected, and now there was a water rationing problem. Having already done multiple self-powered ascents of Mt Meeker and Longs Peak, I decided to forego the Wild Basin Rim idea, and go for as many new self-powered peaks as possible. 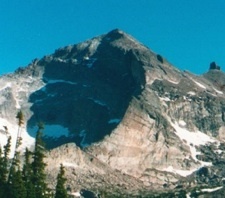 The first was Pagoda Peak. The official trail ends in the trees at Sandbeach Lake. From there, game trails lead to the open tundra and miles of gorgeous remote alpine meadows, rarely trodden, laced with brooks, and carpeted with flowers. I moved quickly toward the elegant Crescent Ridge on the south side of Pagoda. The ridge soars over 2000 vertical feet and features unavoidable exposed middle fifth-class scrambling. It’s one of the great mountaineer’s routes in the Park and is rarely done. On top of Pagoda Peak at 11:00, I talked to a bold fellow who had just third-classed a hard route on the north face. Then I turned to the familiar west ridge that leads to Chiefs Head. Those who have done this ridge know its deserved reputation as a show-stopper. Many unequipped scramblers have wisely reversed course halfway down this ridge and climbed back over the Pagoda summit. I know of three different ways to descend the ridge without equipment and they all require composure and good error-free down-climbing skills. This time I took the quickest (and least obvious) route and felt some relief when I arrived at the low point of the ridge. The summit of Chiefs Head passed by at 12:00 and an hour later I was atop Mt. Alice. One of the greatest feelings in the high country is looking west and seeing nothing but cloudless skies. Today was such a day. Although there were no worries about storms, the fleeting hours and my dwindling water supply did present problems. I made a quick descent to Boulder Grand Pass, where I might have left the Divide on a direct route back to the trailhead. Instead, I continued south along the Continental Divide as if I had unlimited time and energy. I reached the base of the next big climb over the Cleaver at 2:00. Only now did a flicker of reality set in. I would need to traverse a long technical ridge and another summit (Isolation Peak) before reaching the next descent valley. My food and water were as a good as gone. And there was a small matter of a bike ride home at the end of it all. I had bagged only three new self-powered peaks, but it seemed prudent to call it a day and head home – or so I thought. I dropped into a small drainage that runs east off of the Divide. My recollection of the map suggested that the drainage should lead to the main valley trail at Thunder Lake. How easily we are deceived. The rugged descent passed beneath the prominent Eagles Beak (good route possibilities if you want a 10-mile approach), passed a crystalline lake that showed no sign of human passage along its shores (later found to be Indigo Pond). A mile farther down the trailless valley were Eagle Lake and Box Lake, pristine and seemingly never before visited. I was in a valley that I never knew existed; and I have still not found anyone who has ever there. This is surely one of the most remote valleys in the Park and one of the least visited spots on the east side of the Divide. Once into the forest I ran quickly, but made slow progress. There were numerous stream crossings and the forest was dense with windfall. Although I was descending to the east, as planned, I eventually realized that I had missed Thunder Lake. My path ran parallel to the main trail somewhere on the floor of a mile-wide valley. After an hour and a half of off-trail forest crashing, I veered uphill to the north and stumbled onto the main trail probably a mile below Thunder Lake and six miles from the trailhead. Back on the freeway, I ran through increasing tourist congestion, the heat of the afternoon intensifying, and my level of dehydration rising alarmingly. I arrived at my bicycle at 4:20, changed shoes, and rode two miles of dirt roads to the Wild Basin Inn. This time someone actually filled my water bottles at no charge. I was back on my bike on the highway at 5:00 with plenty of sunshine pouring over the peaks from the west. The hills on the Peak-to-Peak highway were exhausting and the descent down South St. Vrain Canyon is never a cruise; it requires work. I refilled water bottles again in Lyons before launching out on the last 12 hilly miles to Boulder. Forty minutes later I reached the city limits, more than 14 hours after leaving. In the end I added three big-plum peaks to my list of self-powered summits. But I left at least as many behind to be visited on another trip. My idea of doing the Wild Basin Rim with a bike approach was laughable and ambitious beyond all reason. It still remains for someone to do the loop from a car. But in truth, I probably knew the futility of the idea when I set out. It’s always best to aim high, and you are often surprised at where you land. This entry was posted on October 30, 2008 at 9:43 pm and is filed under Trip Report. You can follow any responses to this entry through the RSS 2.0 feed. You can leave a response, or trackback from your own site. Holy cow, what a superman! An hour to go from Pagoda to Chiefshead…! The Crescent Ridge looks incredible and if Briggs can solo it, I can probably free and aid my way up the route with a tight toprope. I’ll be trying this route next summer.